1:59:59: The Sub-2 hour Marathon? 1:59:59…will we ever see a sub-2 hour marathon? It’s been just over a week now since Haile Gebrselassie ran himself into history (again) when he broke his own world record by running 2:03:59 in Berlin. More important, he also broke the 2:04 barrier, which gave even more impetus to the usual speculation that accompanies a world record. At the time, I wrote that we’d look at the future of the marathon once the dust had settled. I guess it’s well and truly settled now, apologies for the delay, but here’s our take on the question that has been a topic of some discussion in the last week or so – will man ever run a sub-2 hour marathon? Dave Bedford, for the record, is 58 years old, and perhaps the best response to this I’ve seen is from the guys over at LetsRun, who wrote that he’ll be wrong unless he plans to live to 138 years old! That’s the sentiment of most – they are saying that it’s a long, long way off. For example, Glenn Latimer, who oversees distance running in the USA was quoted as saying that the sub-2 hour marathon is a “far-off dream”, and that “If you look at what his splits were, averaging around 14 minutes 45 seconds for each five kilometres, they’re amazing. You’re talking something else altogether to go down significantly below this”. So he reckons it’s a little soon to be excited by a sub-2 hour performance just yet. I thought I’d take a little more of an analytical look at the chances, borrowing a little from the history the event, and also the commercial aspects that might, in some respects, prevent many great athletes from breaking the record, thus slowing improvement. Then I’ll scan “the lay of the land” to see just who might come through in our lifetimes (assuming that Dave Bedford does in fact reach about 90 years old) and do what Bannister did for the 4-minute mile. One must of course be mindful that people, including scientists, have often painted themselves into a corner with this kind of rationalization in speculation. But here’s our take on the sub-2 hour dream! The starting point in trying to predict the future is understanding the past. And there is no doubt that marathon running is in something of a golden era. Remember, in 1998, the world record stood at 2:06:50, by Belayneh Dinsamo of Ethiopia. That’s only ten years ago, but the record was already 10 years old. However, we then had a flurry of world records, first Ronaldo da Costa and then Khalid Khannouchi taking the record below 2:06, to 2:05:38, through their collective efforts in the late part of the 1990’s. All the while, the world was waiting in eager anticipation for the next generation to turn to the marathon, because great things were expected from them. That is, Paul Tergat, Haile Gebrselassie and Salah Hissou had been rewriting the record books on the track, over 10,000m, and when they eventually moved up to the marathon, the general perception among the running community was that we would be in for some major overhauls! And so it proved. Hissou disappeared (anyone know what happened to him? ), but Tergat and then Gebrselassie certainly delivered on the expectation, even if it did take them a few attempts before they got it right. Therefore, what we are seeing in the marathon today is very much a function of what we saw on the track over 5,000m and 10,000m in the 1990’s. Take a look, for example, at the following table. It shows the world record over 10,000m. The 10,000m world record was lowered by an incredible 30 seconds over a four-year period thanks to the efforts of Gebrselassie, Tergat and Hissou. Who can forget their duels in two Olympic Games, and in particular, it was Tergat who drove one of the most spectacular periods ever seen on the track in his battles with Gebrselassie. The point is that this kind of performance over 10,000m predicted what would eventually happen in the marathon, because we know that the best predictor of 10km time is peak treadmill running speed (measured in a lab-based test), and the best predictor of marathon performance is 10km performance (much better than VO2max or lactate thresholds or heart rate measures, for example). So given the explosion in 10,000m and 5,000m times of the mid-90’s, the sudden drop of the marathon world record was on the cards. Looking ahead – is it sustainable? So what, you ask, is the point of all this? Well, there are some important points arising out of this observation. First of all, the 10,000m record has stablised somewhat since 1998, and the peak of the Gebrselassie-Tergat era. Yes, Kenenisa Bekele has entered the fray and lowered it by a further 5 seconds, and so we are rightly excited at what he’ll do when he turns to the marathon. However, other than him, the depth and quality of performances over 10,000m have not continued to improve. After knocking 30 seconds off the time in four years, we’ve only seen 5 seconds in the next 10. The 5,000m record, meanwhile, has dropped only 2 seconds in six years, and only thanks to one individual. Therefore, applying the same process as above, the marathon record cannot be expected to continue falling at the same rate, with the possible exception of Bekele, and maybe one or two new runners, as yet undiscovered, in the next few years. Secondly, and more important than this, you have to ask yourself the following question: If a 26:30 10,000m runner steps up to the marathon and is able to run 2:05:00, then what kind of shorter distance speed would it take for a runner to do a sub 2-hour marathon? Hopefully, you’ll recognize that breaking a 2-hour marathon does not simply happen in isolation – it is “linked” to other distances, in as much as performance over those shorter distances predicts what happens in a marathon. You cannot, for example, hope to run a 2:05 marathon unless you have a 10,000m capacity quite well below 27 minutes. It’s impossible to extrapolate with precision, of course, but if you want to run a 2-hour marathon, then you have to be running something faster than 25:30 for 10,000m in my opinion! So the next time you ask whether a sub-2 hour marathon is possible, think of the implications – a 25:30 10,000m time? And considering that in ten years, arguably the greatest distance runner ever on the track and country (Bekele) has dropped it by 5 seconds in ten years, then how long will we wait for a runner with that kind of speed? So rather than get carried away with the explosion of marathon records in the last few years, one has to look at the pattern of transition from the track to the road and then ask whether it can be expected to continue. I feel that the answer is “No”, because other than Kenenisa Bekele, there are currently few 10,000m runners who possess the speed and ability to move the event forward like Tergat and Gebrselassie have. Sileshi Sihine, eternal silver medallist behind Bekele, is a runner who should also be capable of a 2:05 time, but not the kind of progress that is required to go under 2:03, let alone 2 hours. Another runner who may prove very successful in the marathon is Zersenay Tadese. 10,000m is probably too short for him, and he seems to be a runner more suited to the longer distances. He’s already succeeded on the roads, breaking 59 minutes in the half marathon, and winning the Great North run in a course record in 2005. That kind of pattern suggests that he is capable of a brilliant marathon, and I dare say he’s the one man of the current track generation who will challenge Bekele when they all run the marathon. 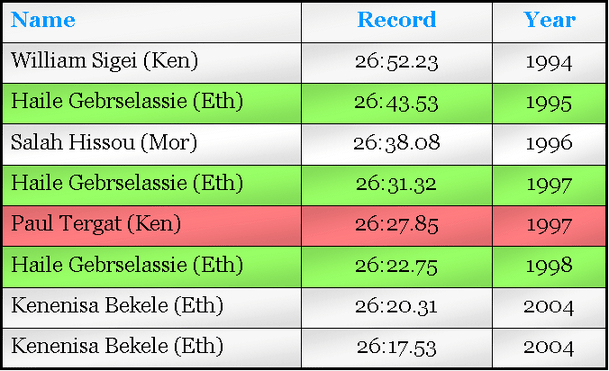 I would hazard a guess that Tadese is capable of a 2:04, maybe even slightly quicker, while Bekele is a 2:03:30, or thereabouts. Quite who is going to run 3 minutes faster than this is anyone’s guess, and that’s why I feel this talk of a 2-hour marathon is very premature! Then of course, there is Sammy Wanjiru. At just 22, he is omitted from the earlier discussion of track runners, because he made the jump to the marathon without following the ‘classic’ path of focusing on track first. That’s not to say he’s not a great track runner – has a 10,000m PB of 26:41, run as a junior, and so I dare say he falls into the same caliber of speed-runner as Geb, Tergat and Bekele one day. In my opinion, Wanjiru is the best marathon runner in the world today. In fact, I’d put his 2:06:32 Olympic win ahead of Gebrselassie’s World Record on a list of all-time performances, firmly at number 1. And if Wanjiru is able to run the right race, on the right day, with the right pacemakers, I think he’s capable of the world record right now. For that matter, so is Martin Lel, also of Kenya. Remember, Lel outkicked Wanjiru to win London in 2:05:16, at the end of what became a tactical race over the last 7km, and he finished with a 60-second 400m sprint! So don’t count Lel out just yet. But Wanjiru seems to hold the aces, and I do think he’s probably capable of a 2:03:40-ish time. Having said that, the big dilemma for all marathon-record hopefuls is “Where do they run it?”. The record is now so strong and difficult to break that it requires the very best conditions – perfect course, perfect pacemakers, and of course, perfect money. That happened in Berlin, and Gebrselassie seems to have found his other “perfect” course in Dubai, where he’ll get a cool million dollars if he breaks the record again (he’s running in Dubai on January 16). But the requirement for money, pacemakers and perfect weather and course make it very difficult to break the record. Can you see Gebrselassie allowing his yearly “time-trial” in Berlin to become a race for the record with Wanjiru? I certainly can’t. For three years, Geb has been Berlin, it’s basically a huge marketing campaign for sponsors with Gebrselassie’s time-trial the focal point of the race. Introducing challengers, particular with other sponsors, hardly seems smart. The cost would be prohibitive anyway. And so rather than facing a physiological barrier, I think that one of the main barriers facing marathon running now is commercial – are there races out there with sufficient prize money to draw the top names, to pay the best pacemakers? And then of course, it can’t be any race – it must be pancake-flat with no wind and perfect weather. That’s a very difficult ask, and it means that maybe only a handful of races exist. If Wanjiru wants to win London (or any of the other big races, like World Champs), then he cuts his chances by half. So where then, will the record come? Forget physiology, the biggest barrier is logistics! All things considered – don’t hold your breath for a 2-hour time any time soon. I think it will be surprising if we see a 2:03:30 clocking in the next ten years, and maybe then it will be Bekele or Tadese. But it will take maybe five or six generations before we even get to 2:02, let alone 2 hours. But then this site will hopefully still be around (we’ll find someone to take it over when we move on, our great great great grandchildren maybe! ), and so if it happens, we’ll eat our words!